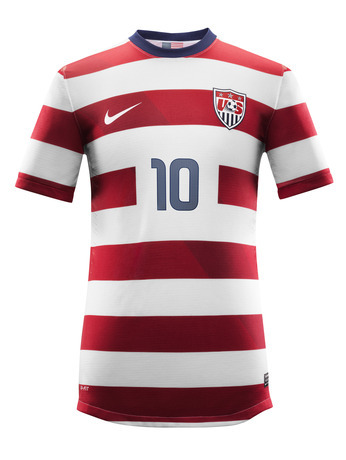 in all the hullabaloo yesterday', i somehow missed the USMNT/USWNT kit announcement... we were long overdue for making the same kit for both teams, though i'm still not sold on the hoops. With the dust having settled after yesterday’s epic announcement, I wanted to extend welcome to all of the new readers who were lucky kind enough to stumble across WSOTP over the last 48 hours. The Cult of Rolfe extends far and wide, and I’ve been mightily impressed at the speed and distance by which they’re able to spread information… you lot had Soccer by Ives tweeting and Taylor Twellman re-tweeting my link within an hour of posting. Stellar work. Hopefully some of you will stick around to see what else the blog has in store… and maybe disseminate my writing a bit further. But just as I warned on Twitter yesterday, if you’re expecting this space to be inundated solely with Rolfe/Fire news… you might end up a bit disappointed. Anyway, thanks again for stopping by the blog — whatever your reason — and as a reward just for you, enjoy some of my ten favorite links from the last week. The new Houston Dynamo stadium looks drool worthy.